Flea Market Finds, 10000 Degrees Edition. | Dinosaur Dracula! It was already crazy hot when we arrived. By the time we left, we looked like we’d been in a pool, or more accurately a pond. I reasoned that this was “exercise.” I’d much rather jump for old Batman figures than jump for Jack. Nothing I found was worth writing poems over, so it’s fortunate that my trade is actually in long, meandering paragraphs. Check out this week’s scores, down below! Super Mario Bros. 3 Happy Meal Toys! 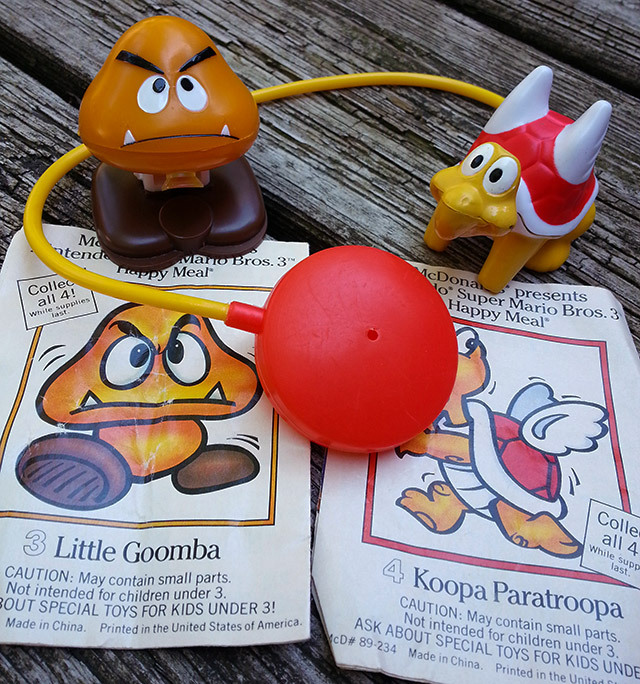 From one of the most beloved McDonald’s promotions ever, it’s Little Goomba and a Koopa Paratroopa! These figures were part of the Super Mario Bros. 3 Happy Meal, from 1990. Given how few Nintendo toys were available back then, we went BATSHIT for that set. The toys came with their original booklets, with admittedly amount to little more than Nintendo Power advertisements. Still, what a score! I can’t think of many people who wouldn’t have paid two bucks for these, but anyone who remembers the time Ronald McDonald cavorted with Mario would pay far, far more. 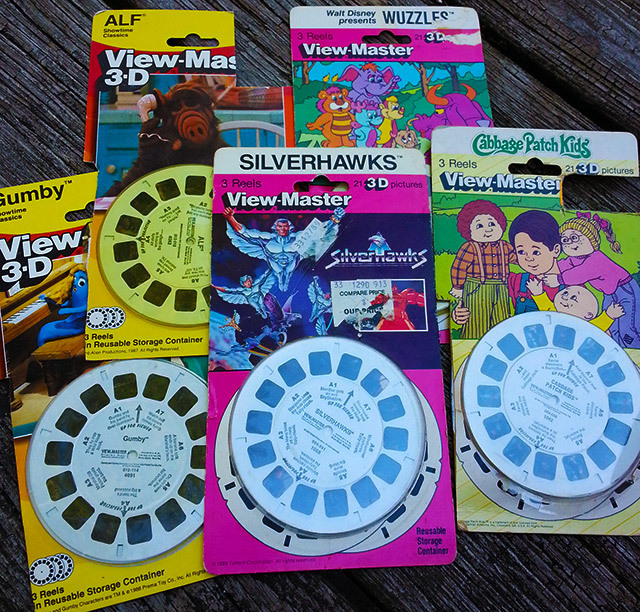 Some guy had a huge lot of vintage View-Master reels for just $10. I went halfsies with Jay, and since this was technically his find, he got first dibs. So yeah, as incredible as these are, they aren’t even the best of them! 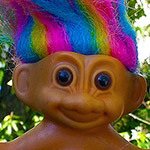 Included are reels for ALF, SilverHawks, The Wuzzles, Cabbage Patch Kids and Gumby. The packages aren’t in such great shape, but since even loose reels would’ve been worth what we paid, I DON’T CARE. I haven’t been mentioning them in my flea market posts, but I’ve been building quite a collection of Goosebumps books on these excursions. Some sellers demand ridiculous prices (like, $3 for books with half-torn covers), but others are much more reasonable. In fact, I picked up three today for just 50 cents! 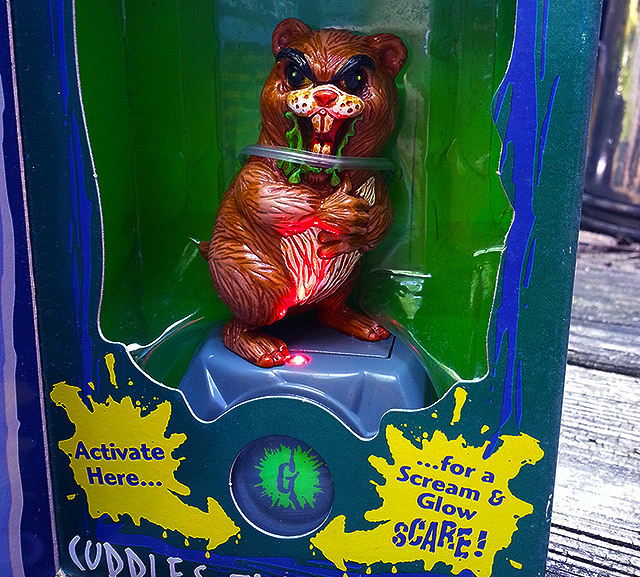 Goosebumps *collectibles* are a totally different story. 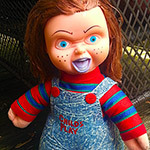 Even some of the franchise’s biggest fans don’t seem to know this, but there are TONS of Goosebumps toys, of virtually every imaginable sort. 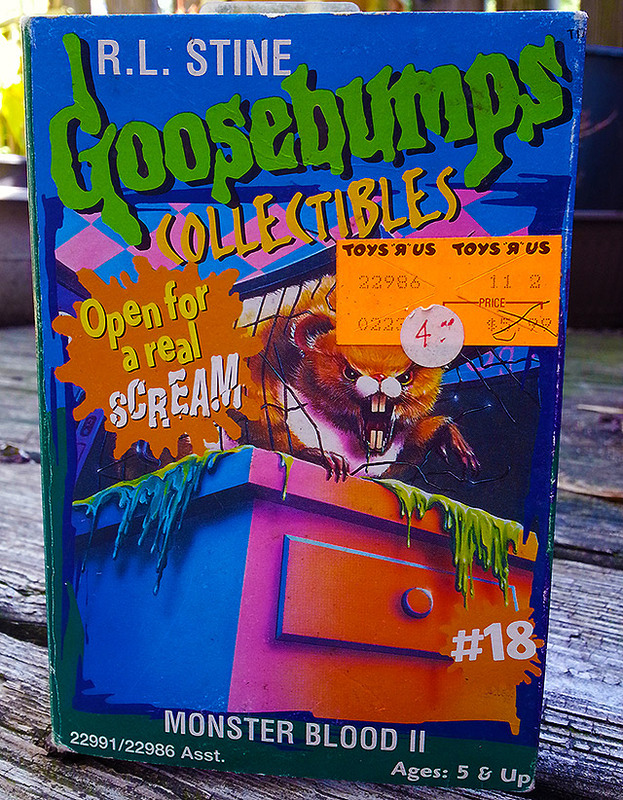 If you find a Goosebumps collectible at a flea market, it’s either going to be dirt cheap or way too much money. In my experience, there’s no in-between. 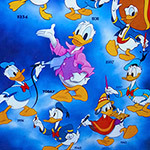 I’m often afraid to ask, because there’s only so many times you can hear “ten dollars” within a conversation about a ratty pencil case before you explode. I’m glad I rolled the dice on this one, though. The price was great (it sells for around $20 on eBay) and it’s just such a goddamned awesome toy. Here, a book-like window box reveals Cuddles the Hamster, a slime-spewing demon rat that would’ve been admirably unsettling even if he didn’t come with a button that emitted horrible screams and blood red light. 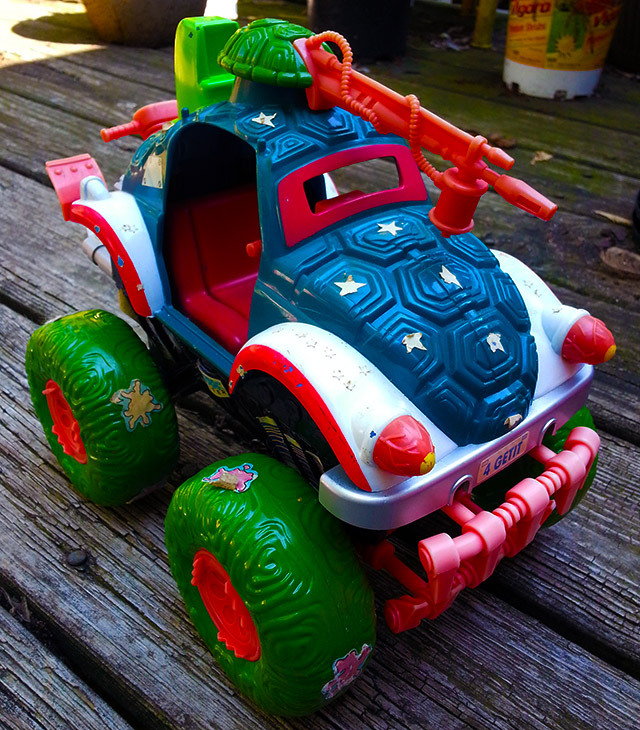 While this was clearly a vintage Ninja Turtles vehicle, I didn’t know which one until Googling later in the day. Made in 1991, this Shell Top 4×4 is dirty as hell, missing tons of parts, and has the faint stench of stewed camel. Had it been just a penny more, buying it would’ve been a mistake. I’ve decided that this will be an “outside toy.” Maybe we’ll turn it into a planter. With a little luck, I’ll someday pluck immature green onions from a Shell Top 4×4. It will be bizarre and beautiful. 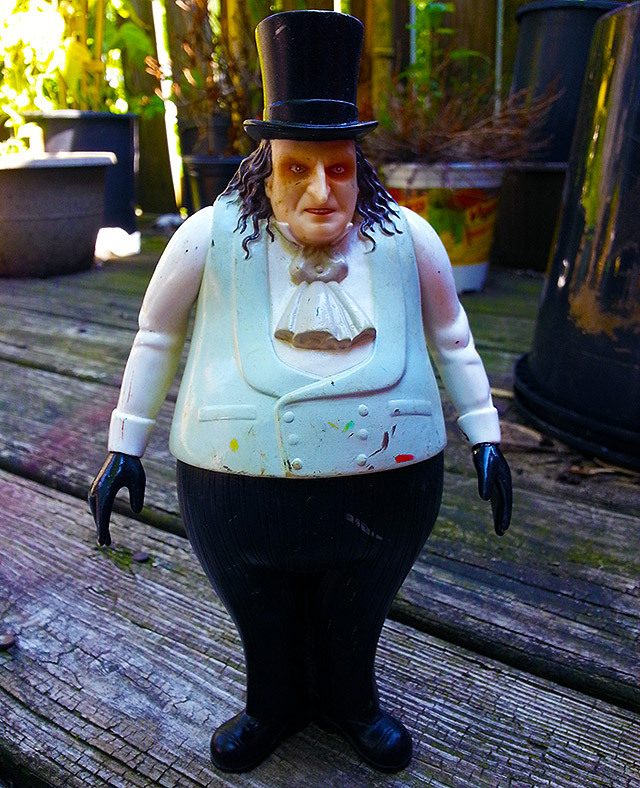 Batman Returns “Penguin” Applause Figure! I’d totally forgotten about Applause’s Batman Returns vinyl figures, which were nearly doll-sized and not to be confused with everyday action figures. I had the Batman and Catwoman figures as a kid, but Penguin always eluded me. 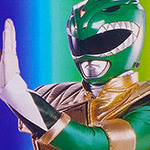 His was the most important in the trio, since Penguin’s “regular” action figure was just a repaint of the DC Comics Super Heroes toy, and looked nothing like the guy from the movie. If you wanted a legit Batman Returns Penguin to run for mayor on your bedroom floor, you needed this thing. 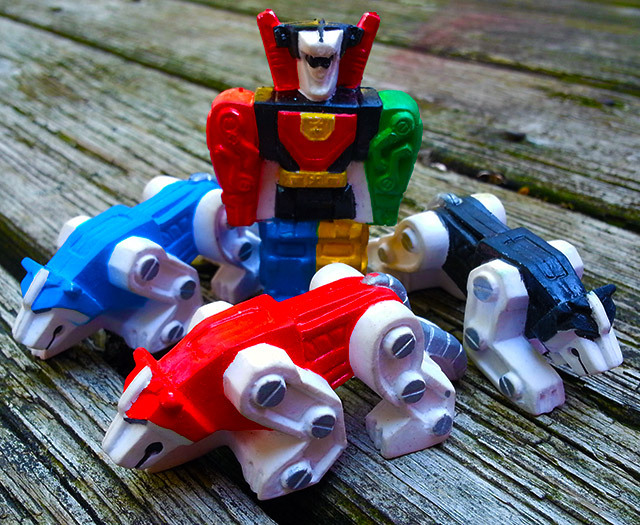 I didn’t need or necessarily even want old Voltron erasers, but the voices in my head were raising red hell over the proposition of me leaving without them. I’m glad I listened, but the truth is that I had no choice. Made in 1984, the erasers were originally sold individually, on cute blister-cards that made them look like tiny-sized action figures. It wasn’t an unfair pitch, because that’s exactly what these are. 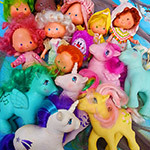 Figural erasers were all over the place in the ‘80s, and the emphasis was less on fixing mistakes and more on giving our big toys Mini Mes to work with. Is this is a job for Voltron? No? 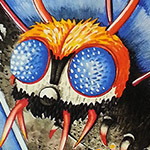 Too small for Voltron? That’s when you send in the Voltron eraser. Reconnaissance missions, most likely. OVERALL: Not a bad haul. I found a few more things, too, which I’m reserving for future articles. Oh, and I just remembered the weird Street Sharks coin purse. Yes, that’s a thing that actually exists. It’s still in the car. So now I gotta go to the car.